Several weeks ago, I was sent a promo code for a new(er) tuning app (released at the end of October), called Teüna. I had seen the app mentioned by The Loop Insight, and it was nice to be able to see the app in action. Over the years, I have mentioned and written about various paid tuners, including ClearTune, iStrobosoft (Peterson), MisoTuner, and Tonal Energy. You might wonder why another tuning app is needed on the market. The answer, is, of course, that there are millions of iPhone and iPad users who have different tastes and preferences. Therefore, my first choice of a tuner might not be your first choice. Elegantly simple design showcases one thing: your tone. Mesmerizing graphics respond instantly to tones. Easily change concert A pitch standard from 420-460 Hz. Tune anywhere in seconds, leaving more time for practice. Suitable for all tonal instruments and voice. Universal app runs on your iPhone, iPad and iPod Touch. Tested extensively with string, woodwind and brass instruments. Effectively tunes elusive low bass notes including 5-string bass, bassoon and tuba. 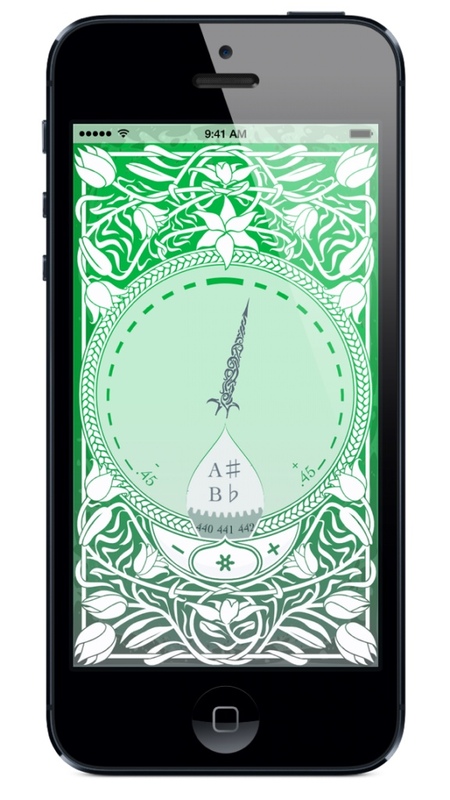 I think the main selling point of the app is its appearance and ease of use; it is pretty clear how to use the tuner and how to even change the reference pitch (if you don't want to use A440). The app definitley brings a sense of style/retro/skeumorphism to table, which I have seen others describe as “beautiful.” I will simply say that it looks very nice. The app is a universal app, working across all iPads, iPhones, and iPod Touches with a microphone and speakers (some early iPod Touches did not have mics/speakers). I haven't figured out the color scheme of the app (it changes color as you tune); the app turns green when the instrument is in tune. I would be better served as a musician if the colors would change to a specific color if flat (blue?) or sharp (red?). I have seen the tuner in use with all kinds of instruments at all pitch levels, so you can safely purchase this tuner for any instrument. A screen capture of Teüna. As for negatives about the app, it appears to only work in portrait mode, and as a music teacher and a tuba player, I prefer to keep my device in landscape mode when on a music stand…but this is not a major problem. The biggest potential problem with Teüna is that the “needle” is small and might not be visible in a band room, and the screen turns green as you approach being in tune, it doesn't turn green as you are in tune. So it might be more of a challenge to use this in the band room if you set your tuner, turn it to the group, and let the students tune themselves. Teüna is (at the time of writing) $3.99, and if you need a tuner, this should definitely be a tuner that you consider, along with some of the other apps mentioned at the beginning of this post. Green is on pitch, and it fades toward red (flat) or blue (sharp). The saturation reflects “clarity”—how much of a pitch there as opposed to a noise, which will register as gray or white. I was thinking scientifically for the colors: red is a slower wave (lower “pitch”) than blue. But also as an artist, the warm colors on the red end of the spectrum seem to match flatness and the cool blue, sharpness. 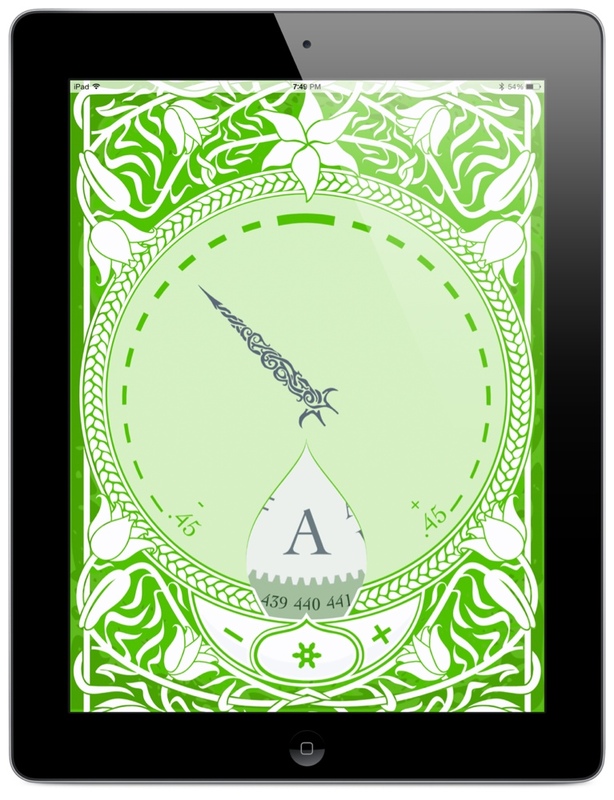 Previous Previous post: Do you need large print sheet music, for your tablet or even paper?